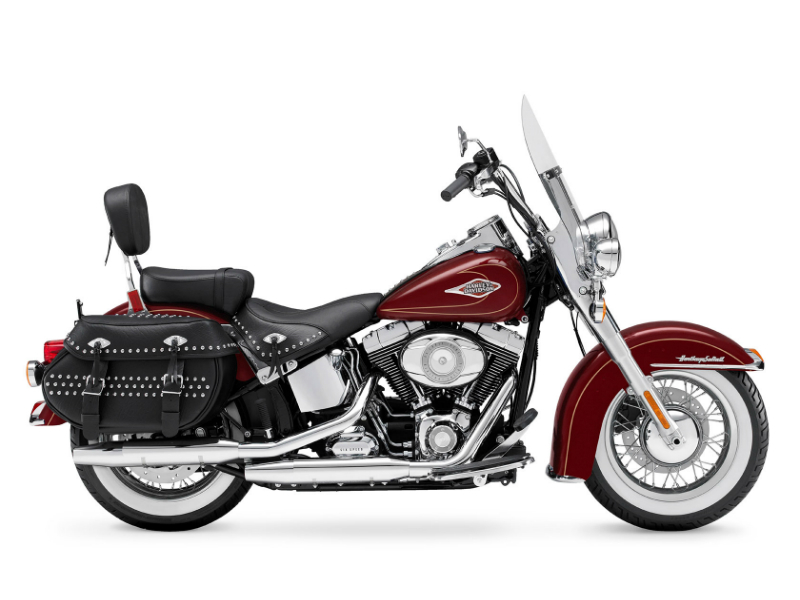 Harley Davidson Heritage Softail Classic is a powerful cruiser that is built for comfort in long distance touring. Read this review to find out its features, specifications and price in India. Harley Davidson Heritage Softail Classic is a touring bike that houses a powerful engine and features to ensure comfort to the traveler. The bike is built with technical features like the tire make or ABS that give high riding control. The handle bar design, seating arrangement for rider and pillion, rider foot board, coil over suspension on swing arm chassis are all some of its features that speak for the luxurious riding experience over the bike. On the other hand large front fender with chrome outline at front, round ball headlamp, unique coating over tank, chrome studs over few parts of the body, white walled tires are all features that boast of the handsomeness of this bike. The touring bike is mounted with a Twin Cam 103B engine which uses large fins to cool itself through air. The 1690 cc V engine as the name holds uses two cams that hold 2 lobes on each to drive inlet and exhaust ports through a push rod and rocker arm assembly. The sequential port injector which uses electronic unit to inject right amount of fuel at different rpms makes the throttle highly responsive. The engine is capable of delivering a maximum torque of 130 Nm at 3000 rpm. This high amount of torque at low rpms gives a breakthrough power to Heritage Softail Classic model at hill climbs and on long running highways. 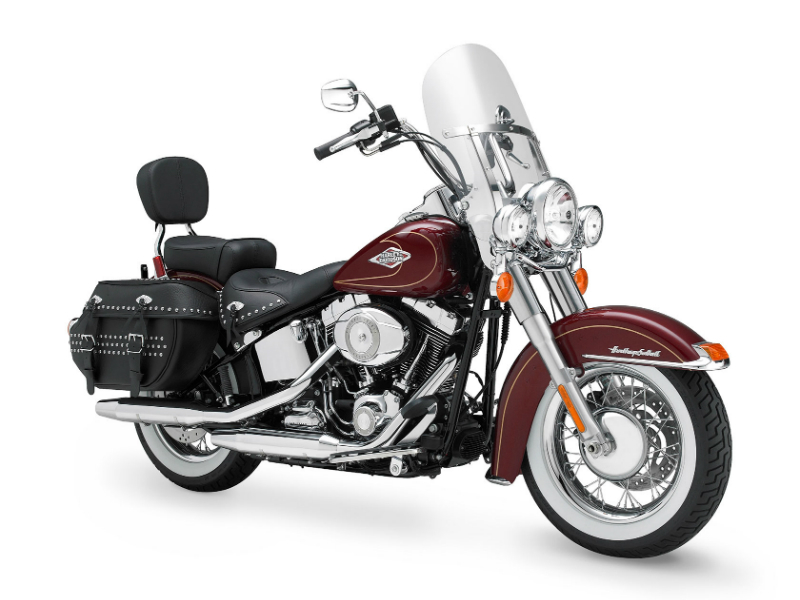 Harley Davidson Heritage Softail Classic is designed for a traveler and it is made in a way to combine comfort with style. Three round dooms mounted on the front for head lamp with a wind shield and a large fender give the ride a grand look. The petrol tank is given the best coating from the Harley Davidson backyard and is badged with a brand medallion which looks very attractive. The chrome coat rules the side view of the bike as it runs on the engine assembly, transmission, exhaust and air filter. 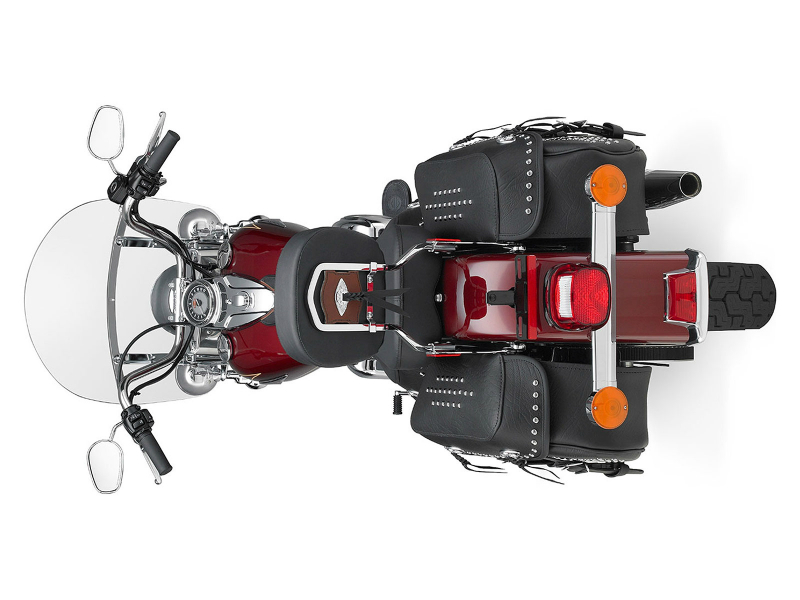 The bike carries two bags on its rear which are studded with chrome buttons. The seats are designed to give comfort on long miles and the rear seat is given a backrest for better support to the pillion during a trip. The tyres are coated with white paint on side walls. The Dunlop tyres on the front and rear are fabricated from a material that could withstand long riding conditions and are given treads to grip the road under different weather conditions. The front tyre is specially designed to have maximum grip with the road. The tires are capable of running at speeds up to 210 km/hr. The front and rear are loaded with disc brakes that use four and two pistons for braking respectively. The bike also has Antilock Braking System for effective handling of this 341 kilo mammoth touring bike. The bike is given a windshield to divert air that would strike the body of the rider. Bike is mounted with a cruiser handle bar that is inclined towards the rider to position him in a straight and comfortable posture. Harley Davidson Heritage Softail may provide a mileage of around 15 to 17.5 kms on a litre of fuel. The Ex-showroom price of this bike in New Delhi is Rs 20,45,000.